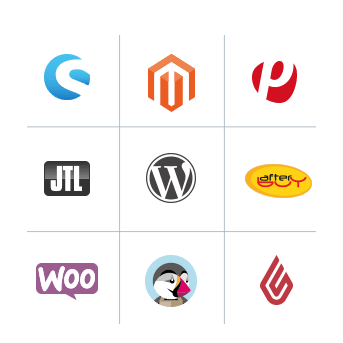 Our e-commerce newsletter software offers many integrations and plugins that allow you to connect your online shop with Newsletter2Go in no time. Moreover, you can send out effective sales newsletter with minimal effort on your part. The email marketing integrations are free of charge, always up to date and available for numerous shop versions. 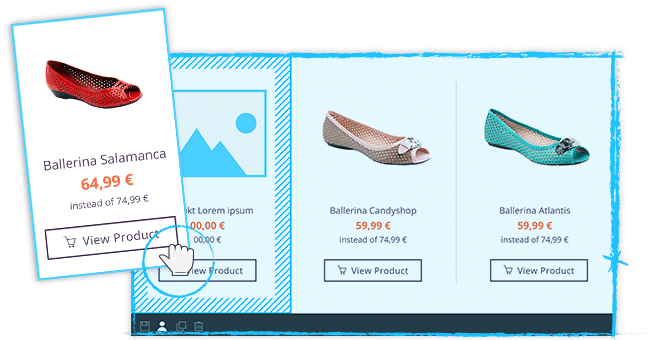 Newsletter2Go offers ready integrations for a variety of online shop systems, for example Magento, plentymarkets and Shopware, among many others. Customized integrations for your own system are available upon request. Your shop clients will easily become your newsletter subscribers as well thanks to the integrations. Your recipient list will be imported, updated and synchronized on a daily basis. Don’t waste any more time manually managing new subscribers, unsubscribe requests and bounces. Newsletter2Go ensures sensitive data handling procedures and we would never pass or sell your data. The whole email marketing solution for webshops works in accordance with the European data protection guidelines (95/46/EC). Newsletter2Go rewards you for great email marketing. You will receive credit paybacks for outstanding email performance. The better the performance, the more credits will you retrieve. Consequently, that will translate into higher ROI! Transfer complete products from your web shop to your newsletter with just one click, including the product name, price, description, image and link to the product. Save yourself the arduous task of copying, pasting and reformatting your products. Just enter the product ID and our e-commerce newsletter software will do the rest. The 1 click transfer function is only available in conjunction with a premium newsletter template. 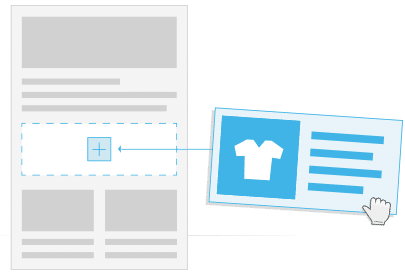 To use 1 click product transfer, you need to have a Premium newsletter template created. The Template Creation is done exactly according to your wishes. If you want, we can also design it for you. Once your template is ready, you can insert and work on your pictures and text however you please. Build a free newsletter sign-up form for your website and generate more leads with Newsletter2Go. Building the form doesn’t require any programming knowledge. You can build the form in the generator and then insert it anywhere you want on your shop website (e.g. pop up, or subscription box at checkout). The double-opt-in process will ensure that you stay on the right side of the law whilst generating valuable leads. Sit back and relax – our e-commerce newsletter software with automatized emails will take care of customer relationship building and lead generation. You need to set up a lifecycle campaign and trigger email campaigns only once and your customers will be sent emails based on certain events (for example birthday campaigns) or their behavior (for example abandoned cart email). Thanks to the real-time product recommendation feature, your recipients will enjoy getting relevant products in their emails. Effective emails shine through due to their relevance. Improve the relevance and send out a unique and personalized email to each subscriber. There are multiple ways to send personalized emails (e.g., addressing your subscribers with their name) and segment your contacts (by gender, purchase history, age etc.) with our e-commerce newsletter software, which makes email personalization super easy. A/B tests help you to test up to 9 different newsletter versions. You can test the subject line, sender name and content. 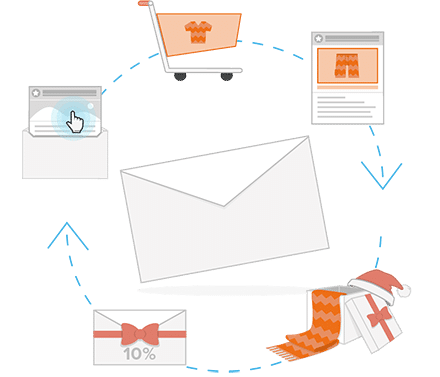 The most successful combination is automatically selected and subsequently sent out by our newsletter software for online shops, thus optimizing the performance of your newsletter. All purchases attributed to your newsletters are tracked and displayed in detail. Take advantage of Google Analytics to understand better your recipients buying decisions and their behavior on your website. This is an amazing feature: you can see the quality of your contacts at a glance. Depending on their engagement, a subscriber will be rated from 0 to 5, where 5 means that your contact is very active. This rating can be used as a trait for contact segmentation. You can immediately see your newsletter performance (open, click, and unsubscribe rates) in real time. Cluster Analysis enables you to track separate groups and compare them against each other so that you can identify areas of opportunity. 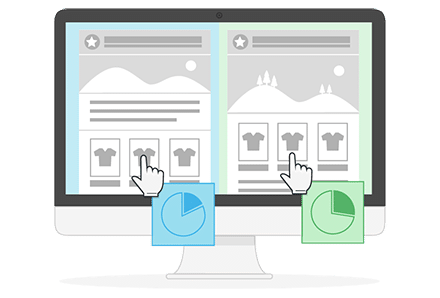 The detailed analysis option makes our newsletter software for online shops a powerful tool every marketer would benefit from.